What about a Lentil is Less Creative? | Welcome to the EvoS Consortium! What about a Lentil is Less Creative? Heading in different directions. Bulges in the brains of modern human infants make our adult brains (above, blue) rounder than those of Neandertals adults (top, red). Catching up again on articles sent to me over the past few years, a 2010 Science summary by Ann Gibbons of a Current Biology piece by Philipp Gunz & colleagues (“Brain development after birth differs between Neanderthals and modern humans”) indicates that the globular shape of human brains may diverge from the lenticular shape of Neanderthal brains because of expansion in the parietal, temporal, & cerebellar regions among Homo sapiens during infancy. In living people, those areas of the brain are linked with key functions such as the ability to integrate sensory information and to form abstract representations of the environment. Neanderthal and modern human brains grow differently. (A) For the virtual reconstruction of the Neanderthal neonate Le Moustier 2, CT scans of individual fragments were assembled on the computer. Fragments that were mirror-imaged to the other side are plotted in a darker shade. The gray surface represents estimated missing data. 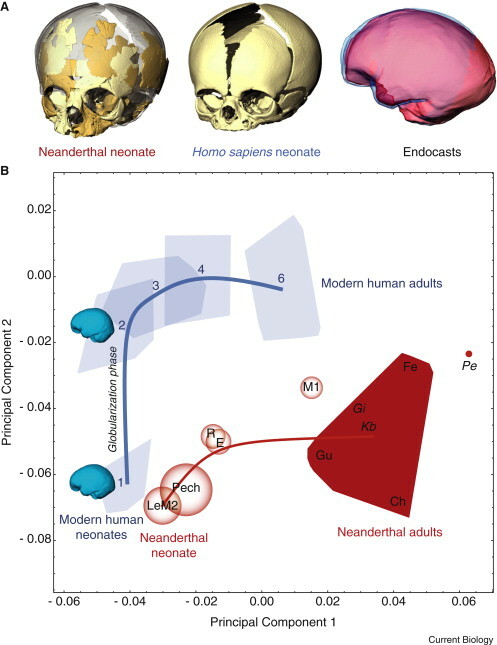 At birth, Neanderthals and modern humans have very similar endocranial volumes and shapes (red: Le Moustier 2; blue: modern human). (B) A principal component analysis of endocranial shape changes from birth (age group 1) to adulthood (age group 6). The convex hulls for modern humans (blue) are based on dental age groups. The fossil convex hull (red) is based on the Neanderthal adults only. The average developmental trajectory is plotted as a solid line. Endocranial mean shapes visualize the shape change during the modern human globularization phase between age groups 1 and 2. All fossils were reconstructed multiple times; each distribution of reconstructions falls within the respective semitransparent disks (Neanderthal specimens: LeM2 — Le Moustier 2; Pech – Pech de l’Azé; R – Roc de Marsal; E – Engis 2; M1 – Le Moustier 1; Gu – Guattari; Fe – La Ferrassie 1; Gi – Gibraltar; Ch — La Chapelle-aux-Saints. Archaic Homo: Kb — Kabwe; Pe — Petralona). This supports a model proposed by cognitive archaeologist Steven Mithen in his 1996 book The Prehistory of the Mind. Mithen suggests that humans may have outcompeted Neanderthals because our ancestors were capable of more creativity. This may have been possible because H. sapiens brains were more modullarly integrated. Following Howard Gardner’s model of multiple intelligences, Mithen hypothesizes that the increasing encephalization of Homo brains was the result of the exaptation of intelligences for novel purposes & development of new areas with unique specializations (such as the prefrontal cortex). Mithen proposes that the integration of those modules varied (& varies). 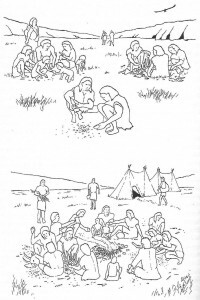 These general purpose modules, for such things as technical intelligence, linguistic intelligence, social intelligence, & natural history intelligence, became more integrated in H. sapiens than H. neandertalensis. The proximity of neural tissues from one intelligence area traveling through that of another facilitated dendritic connections that were otherwise too distant to be likely, facilitating creativity by enabling our ancestors to borrow a way of doing things from one area of intelligence & using it in another realm. Mithen suggests that spacial orientations of living floors may reflect cognitive orientations & points to the differences between Neanderthal & H. sapiens living floors as indicative of his thesis. 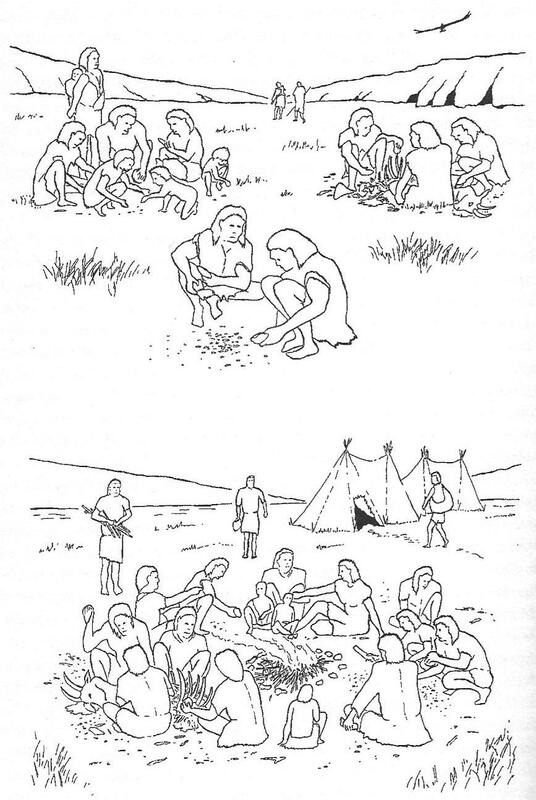 Neanderthal modes of living, like their brains, are spacially separated, whereas those of H. sapiens are concentrically oriented around campfires & hearths. This physical proximity of different activities may be reflective of neural correlates & also reinforce them, providing people the opportunity to see other activities being conducted & get new ideas. While this model remains largely speculative, the Current Biology study lends it support in areas of the brain that would have been critical to the development of creativity & modular integration. This entry was posted in Anthropology, Biological Anthropology and tagged brain expansion, cerebellum, Jean-Jacques Hublin, Neandertals, Neanderthals, parietal, Steven Mithen, temporal. Bookmark the permalink.